as you know, right around Halloween, O got super mega obsessed with Spider Man. 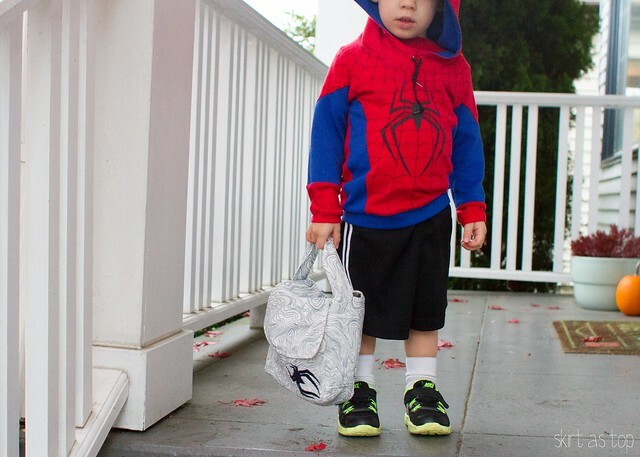 barely a day has gone by that he hasn’t worn (or requested to wear) his hoodie – that superhero love that so many little guys seem to have has been awakened. 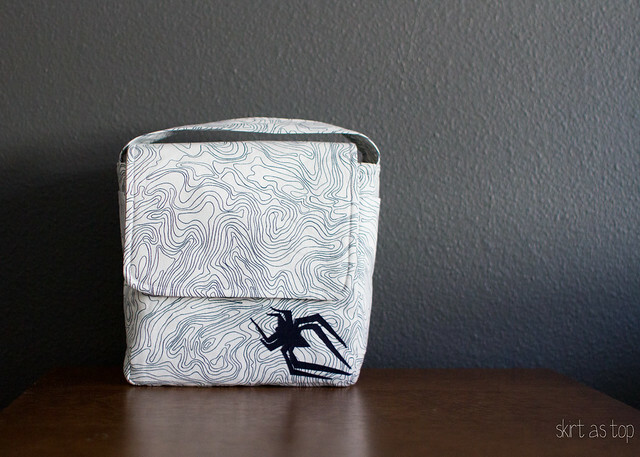 so when my new sponsor, Virginia of the lovely Gingercake Patterns, asked me if I’d join her holiday pattern tour, i thought there couldn’t be anything much more perfect than making this fella his own Spider Man lunch box! this is Gingercake’s Love Your Lunch Box pattern. Gingercake first came to my attention last year when Gail made this adorable one for her little gal. it’s the perfect size to hold lunches for kids to carry, and i love the idea of customizing the fabrics to what your kid is into, since lunch boxes inevitably get gross and need to be replaced pretty regularly anyway. in O’s case, what he’s into right now is spiders (and webs). 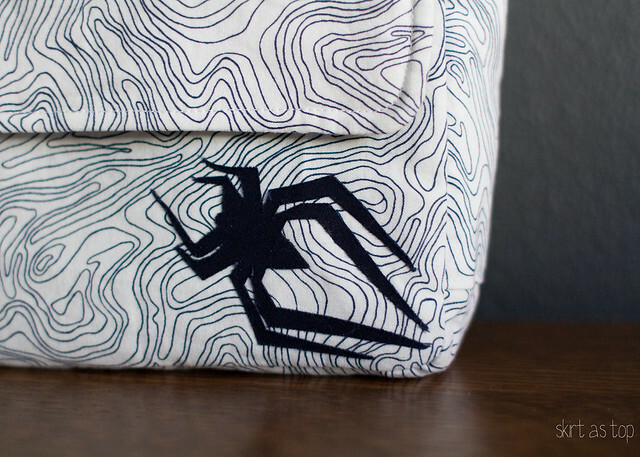 the “web” fabric is topo in navy from architextures by Carolyn Friedlander, one of my all time favorite fabric lines. so cool, so versatile. i think it’s is supposed to suggest elevation lines on a topographical map, but it works as a web too, right? then i stuck a little spider appliqué on there. the inside is a sturdy seersucker/ticking i’ve used a few times. i thought it could be more washable than laminated cotton (either is suggested in the pattern). it was clear and quick sew, though probably not a super beginner project just because it gets tricky sewing a gusset around tight curves, but no biggie if you’ve made some things. he really does love it! he even wanted to pack his own lunch, he was so excited. and i’m pumped to have a go-to lunchbox pattern that i can make again a year from now with whatever his obsession is then. 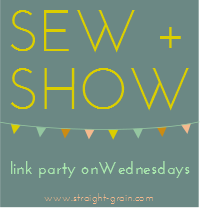 would you like to win a Love Your Lunchbox pattern of your own? it’s a great one to have for little gals or guys in your life, and not too hard to enlarge for adult lunches either, i wouldn’t think! customize it up and it’s a fun gift to give for the holidays. to enter the giveaway, simply leave a comment on this post telling me your favorite pattern over at Gingercake Pattern Shop (there are such cute ones…you know i’ve got my eye on the Lucky the Elephant for Em). giveaway is open until Friday, November 15 at 8pm Pacific Standard Time. 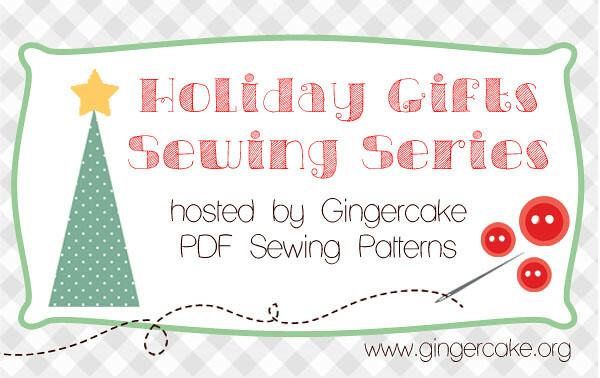 winner will be chosen at random, contacted by email, and will receive the PDF pattern from Gingercake. one entry per person, void where prohibited by law. I’m liking the hobo lunch sack and the duffle bag. Thanks for introducing me to this line of patterns! How can you pick a favorite? The animals are all so cute. I do think the duffle bag is wonderful and would lile to try it. Will put this site on my pinterest. Thanks! Love both max and Lola the owl! I love Annie’s penguin and the Love your lunch box!! Oh! How fantastic! I have been looking for a good lunchbox pattern for exactly the reason you stated. They get unbelievably gross! I tried making a pattern for this myself but I wasn’t that happy with how it came out. Yours is so perfect. I might have to try this one. I love annie´s penguin pillow. 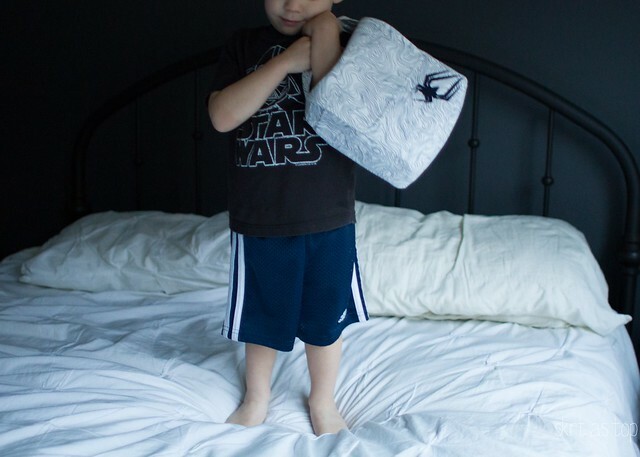 Love the lunch box, my little grand son is into star wars and that would be a very cute lunch box. I also liked ginger cakes owl pillow pattern, my other grandson is into owls at this time. The three layer clutch is pretty genius. Thanks for the chance! What a cute site. I like the Waste Free Lunch Bag. 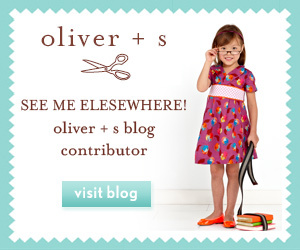 I love the ‘Love your Lunch box’ and also the art caddy – that’d be so much fun to make for my kids! i like “lucky the elephant” and “annie’s penguin” patterns but the “love your lunchbox” pattern looks pretty good too. thanks for hosting the giveaway! I love the waste free lunch sacks. And the lunch tote. And all of the pillows. Thanks for the chance to win! I love the get away bag! And all the lunch sacks. Just about everything actually! I think I’m going shopping soon!!! I actually love the lunch box pattern, and yours is super nice! But the polar penquin is adorable and that would be a great holiday gift item ! thanks! My daughter loves the folksy bunny. 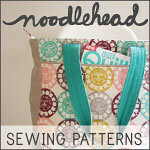 i’m crazy about the modern folksy bunny, but really want that lunch bag pattern. 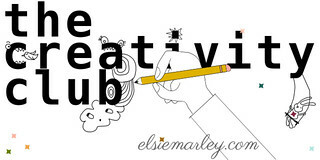 love the one you made and the hoodie – so fabulous! I love the 3 layer clutch!!! Is looks very pratical to use!!! Her Crayon Art Folio is darling! 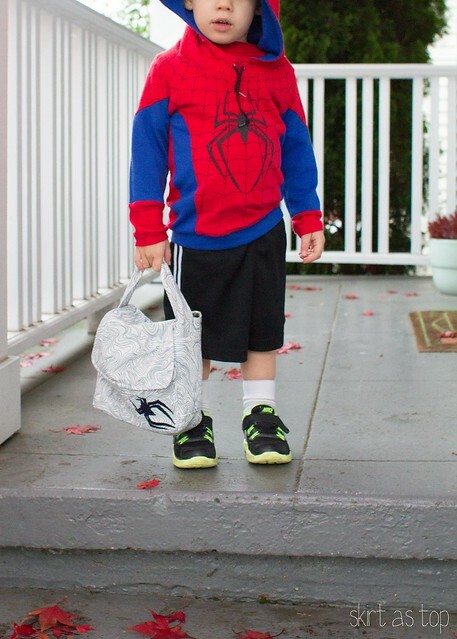 Love love love the Spidey lunch bag too. Great job!! I saw the lunch bag last week and thought it was awesome! I’ve got my eye on the hobo style lunch sak–for myself! Love lucky the elephant too. I love the on the go organizer! but I do love the lunch box too! I love the Annie’s Penguin pattern, cute and unisex! The lunchbox you made is adorable! That is perfect for your little boy! I can’t pick which design is my favorite from Gingercakes – they are all so cute! I love Annie´s penguin. It would be perfect pillow for my little one. So many cute options! I also like the hobo lunch sack. i also like the hobo lunch sack. Katie bird had just gone on my wishlist! Annie’s Penguin is very sweet and would be perfect for winter sewing projects! Thanks! I would have to be a bit on the practical side and say that the get-away bag is my favorite. I made one for each my girls for Christmas last year and they absolutely love them. so cute! 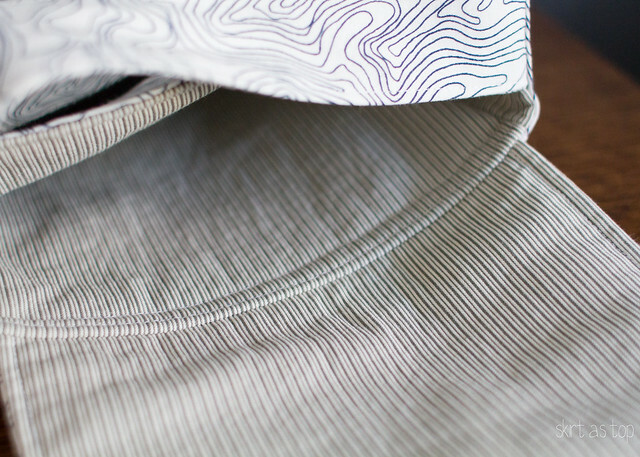 I love that topography print. I like the 3 layer clutch and the duffle bag! I’ve got an elephant lover too, I might just have to get Lucky and make him one! What a great lunch bag, and that print is my favourite in the line. I have some scraps of it saved for something special:) Thanks for the giveaway! I love this pattern as well. It’s my first Gingercake’s pattern. I made my girls lunch boxes for school this year and used PUL for the inside so it just wipes out. You are right about it not being a super beginner project but after 34 months of school they still look like new. I love lucky the elephant too! 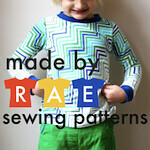 Thanks for the chance to win the lunchbox pattern…it looks like fun! 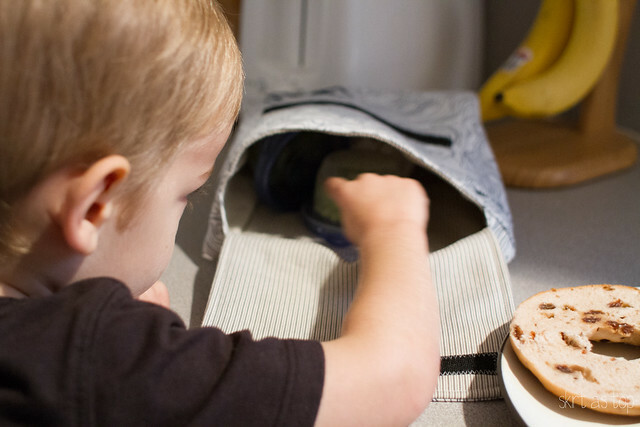 I love the owl – your lunchbox is great!